PITTSBURGH-Roboticists at Carnegie Mellon University will field two teams in the Defense Advanced Research Projects Agency (DARPA) Robotics Challenge, a competition in which robots will perform complex, physically challenging tasks as they respond to disaster scenarios in human-engineered environments, such as nuclear power plants. DARPA officials announced today that it had selected "Tartan Rescue Team," headed by Tony Stentz, director of the National Robotics Engineering Center (NREC) and research professor of robotics, and "Team Steel," led by Christopher Atkeson, professor in the Robotics Institute and Human-Computer Interaction Institute, to receive funding in the competition. A team from a Robotics Institute spinoff company, RE2 Inc. of Pittsburgh, also was selected. DARPA announced the Robotics Challenge last spring as part of its response to the federal government's National Robotics Initiative. Officials noted the supporting role robots played in mitigating fallout from the Fukushima nuclear plant disaster in Japan and advanced the Robotics Challenge as a way to inspire innovations that would make ground robots more capable of intervening in high-risk situations. 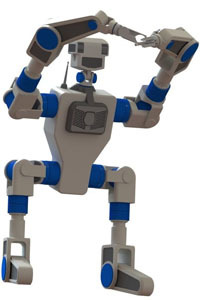 The Robotics Challenge is now officially under way, with a software "virtual" competition planned for June 2013, followed by live hardware challenges in December 2013 and December 2014. The ultimate winning team will receive a prize of $2 million. Tartan Rescue Team was selected by DARPA as one of seven teams in Track A, each of which will be developing a new robotic system including both hardware and software. The team will receive $3 million from DARPA to help with development and may eventually qualify for an additional $1 million. Team Steel and RE2 were among the 11 teams selected in Track B. The Track B teams will develop software only; following the virtual competition, select Track B teams will qualify to receive a DARPA-provided humanoid Atlas robot developed by Boston Dynamics for use in the live competitions. The team will initially receive $375,000. Depending on its performance in competitions, the team may later qualify for $750,000 and $1 million allotments. "CMU's strength in this competition is that we have always taken seriously the idea that we need to make robots that do things in the real world," Atkeson said. "We have a wealth of experience here, so it's easy for me to get help from a bunch of colleagues to do this." Carnegie Mellon's Tartan Racing team was victorious in an earlier DARPA robot competition, the 2007 Urban Challenge road race. Carnegie Mellon's self-driving SUV, Boss, navigated more than 50 miles of urban and suburban streets, following all traffic laws and safely sharing the road with robotic and non-robotic vehicles, in four hours and 10 minutes - almost 20 minutes faster than the second-place finisher. "Tartan Racing set a high standard for all of us," said Stentz, who was a member of that team headed by Robotics Professor William "Red" Whittaker. "We are seeing the payoff from the Urban Challenge now, as more carmakers are installing driving assistance and collision-avoidance systems. If the Robotics Challenge can have that kind of effect on disaster response, all of society will benefit." "One of DARPA's goals for the challenge is to catalyze robotics development across all fields so that we as a community end up with more capable, more affordable robots that are easier to operate," said Gill Pratt, DARPA program manager for the Robotics Challenge. In addition to Tartan Rescue Team, Track A competitors are Drexel University, Raytheon, SCHAFT Inc., Virginia Tech, NASA's Johnson Space Center and NASA's Jet Propulsion Laboratory. In Track B, Team Steel and RE2 will be joined by teams from Lockheed Martin's Advanced Technology Laboratories, University of Kansas, MIT, TRAC Labs, University of Washington, Florida Institute for Human and Machine Cognition, Ben-Gurion University, NASA's Jet Propulsion Laboratory and TORC Robotics. Both Carnegie Mellon teams are actively soliciting companies and other donors for additional funds to bolster their entries. In return for funding, companies can receive favorable access to intellectual property and promotional and public relations exposure. Carnegie Mellon University’s National Robotics Engineering Center plans to build a humanoid robot, shown in this rendering, to respond to disaster scenarios in the DARPA Robotics Challenge.